Sent out to kill the monster known as the Dire Beast, Kelthan and his team- the elite warriors known as the Battlecats- found the answer to a mystery. Long thought lost, King Eramad II had been transformed into the savage monster… a fact that every King since has worked to keep hidden. Now the current King has found the Battlecats to be traitors to him and to the nation of Valderia. Rather than declaring their offense openly, King Eramad has forced them into a gladiatorial death match to commemorate the three day celebration known as Rorinhal. 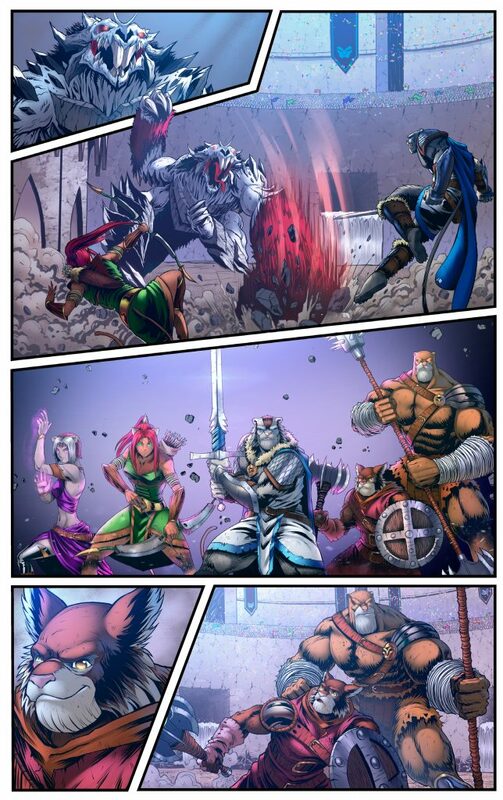 It’s a fight to the death that the Battlecats have to win in order to prove their loyalty to the Crown. From day one, Mad Cave Studios has worked on setting themselves apart from the crowd. In the beginning, they did that with a heavy focus on spectacular artwork that looked like nothing else I’ve seen being produced. Since then, they’ve grown up and have started to expand both their range of titles and the skillsets they use to put them out into the world. Possibly one of the busiest guys in comics, Mark London has been handling all of the writing for the Mad Cave books. His credits range from cyberpunk crime noir (Midnight Taskforce), to Biblical mythology (Knights of the Golden Sun), to supernatural action set in feudal Japan (Honor and Curse). 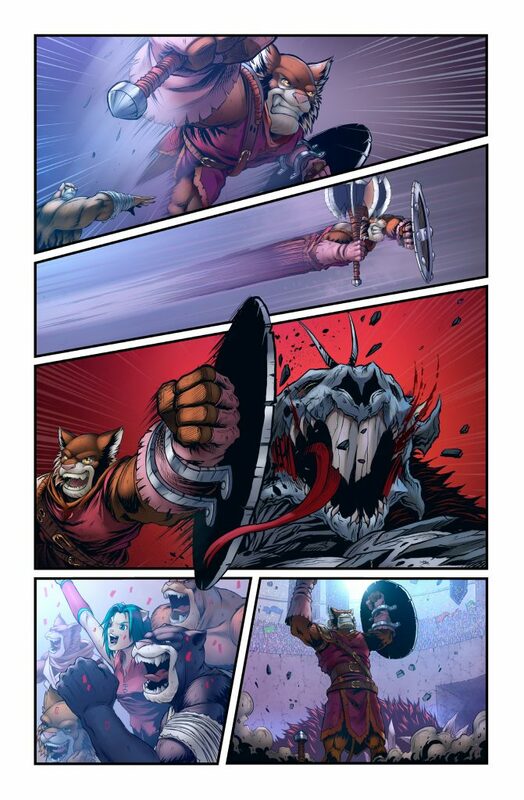 Battlecats, flagship of the Mad Cave lineup, is everything that’s cool about epic fantasy. 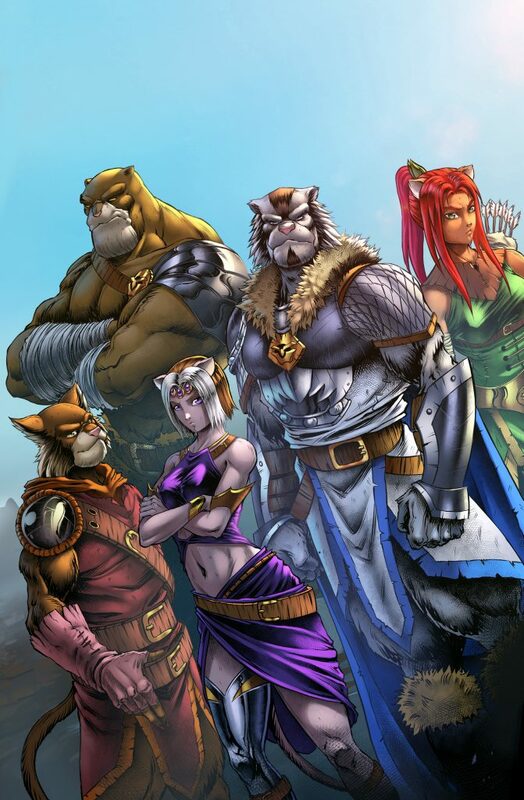 Combining the action and anthropomorphized cat people of Thundercats (the original, not the remake) with a growing sense of intrigue showing hints of inspiration from Game of Thrones, it’s really hard not to like this title. Along the way, London has grown as a writer… he’d pretty much have to, with all of the practice he’s gotten handling all those titles. His dialogue has smoothed out some of the stiffness common to many new writers, and he’s really started to layer his plotlines. In the beginning, the Battlecats pretty much went out and kicked the crap out of stuff. Now, readers are starting to dip a little more deeply into the world of Valderia. We’re also getting to see more of the personalities of the characters as London lets them develop on the page- I’d love to see each character get a spotlight issue, maybe a series of standalone one-shots that focus more on the individual Battlecats and their origins… fingers crossed. Likewise, the artwork has been coming along and building on what was laid out in the beginning. I mentioned that the early issues of Battlecats were all about the action, and it was all well done but the strength of the art was more in the covers or the spreads where it was all about striking the dramatic pose. The action itself was good, but it just seemed a little stiff. With the opening issue in this second story arc, Michael Camelo is looking to loosen things up. His characters move with more dynamic fluidity, which is totally appropriate and awesome given the feline nature of the ‘Cats. 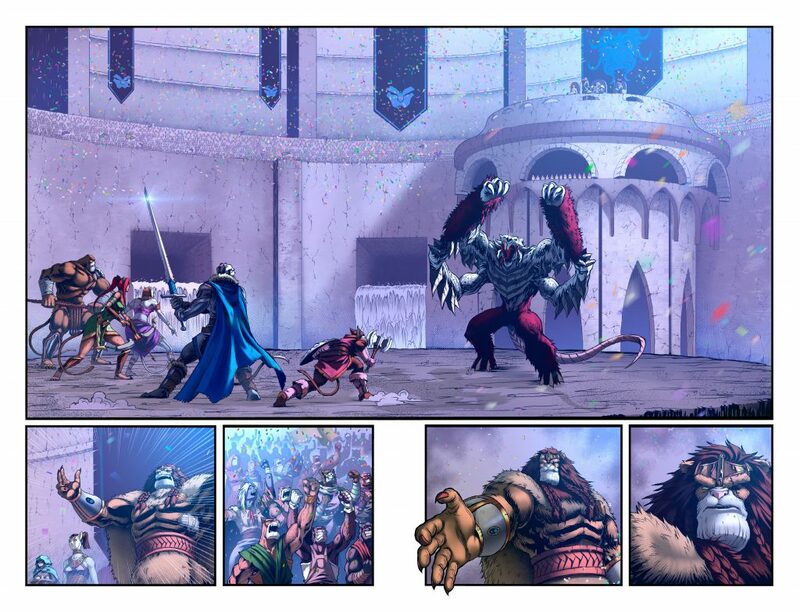 There’s a full page spread in particular that I’d love to see as a print (hint, hint) that shows the Battlecats acting as a unit, showcasing Camelo’s ability to plot out an action scene. I can see the sequence of events in the ‘Cats’ combined attack and the affect is very cool. Rounding out the visuals on Battlecats, Tekino uses a color palette that’s bright and vibrant. The characters each have their own theme, defined as much by color as by individual nature. Likewise, the backgrounds are all distinct in their range of hues, with switches from one scene to the next easily marked by shading. Even in a flashback scene, Tekino gave the setting a hazy, almost ethereal quality that established its own look and almost didn’t require a text box stating we were seeing something from ten years past. The last tent pole that can make or break a comic is in the lettering. I’ve said it before, and I’ll apologize to regular readers cuz I’m about to say it again… if you’re not aware of the importance of good lettering in a comicbook, it’s because you haven’t seen really bad lettering. Miguel Angel Zapata doesn’t get in the way of the action on the page. His dialogue utilizes the open space without crowding the characters and their exploits, and he doesn’t try to get too fancy with the word balloons. Where he does let himself cut loose is in the sound effects, and it works out very well. Remember the scene in Aquaman, where Arthur and Orn are duking it out in the Ring of Fire? There’s one shot that was in all of the commercials, where the crowd is stunned into silence over a spectacular hit and then erupts into cheers like the fans at Lambeau Field when Aaron Rodgers stiff arms a blocker and runs in for a touchdown. This issue has a scene that, to me, read just like that. That’s Zapata doing his job well, knowing when to keep things subtle and when to cut it loose. Damn. I’m starting to feel like I should be on the payroll or something, the way I’m doing nothing but singing praises to the folks at Mad Cave Studios. It isn’t so much that the books are perfect from cover to cover… it’s just that with all of the effort they’re obviously putting into creating quality titles and sending them out into the world, it’s tough to get past that enthusiasm and find something to talk down. In general, I don’t like highlighting what I don’t like in a comicbook (someone made that… that’s someone’s “baby”). Instead, I prefer to leave that to the trolls out there and just have a good time talking about the good stuff. C’mon, man… comics are awesome! If we didn’t love them, what would we be doing here at thePullbox? 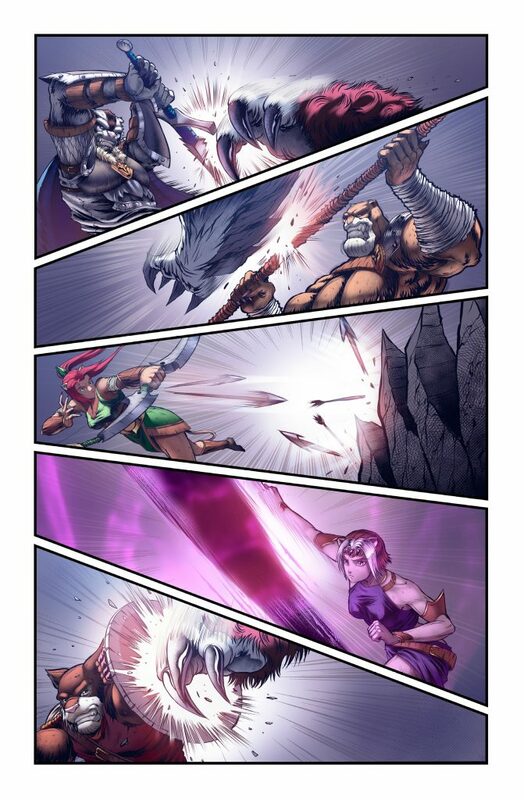 If you think I can’t possibly be right about Battlecats, I challenge you to go out and pick up a copy for yourself. Come on back to tell me what you think they did wrong and feel free to call me to task on it.